User onboarding was also a very valuable component of our email strategy and allowed us to build some of this context in early on in our relationship with customers. Samuel Hulick has built a tremendous resource breaking down popular products’ onboarding flows, which was really helpful for us. Sometimes, though, I’ve found it can be even easier to attack LTV. With three emails, you can improve your LTV almost instantly. Dunning emails help ensure that expired credit cards do not cause lapses in subscriptions. Since the average credit card expires every 3 years (36 months), you can conservatively estimate that 3% of your customers’ cards will expire each month. That isn’t taking into account folks that lose their credit cards and request new ones. Let’s say you have 1,000 customers and your product costs $99/month. If 3% of those leave because of a preventable error, you could be missing out on $2,970 each month. If you use Stripe, there are services like Churnbuster that help you quickly launch dunning emails and notifications. If you want to go the manual route, it’s easy enough too. Based on what we know about our open rates, this flow attempts to ensure that each user sees at least 2 emails in the dunning flow. This tactic improved updating of lapsed credit cards by 75%. This is a quick win, and it is surprising how infrequently SaaS companies use it. Oftentimes companies push for an annual subscription during the signup process highlighting discounts vs paying monthly. But for a user new to a product it is a big ask to pay for a full year up front. Users are more likely to upgrade to an annual subscription once they’ve become comfortable with the product. 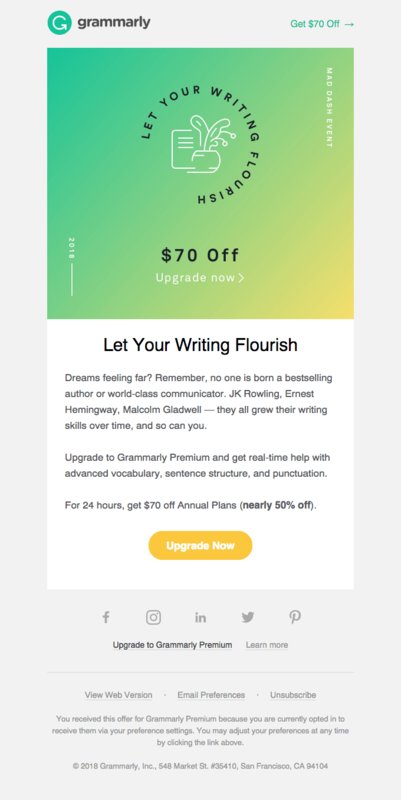 An easy way to deploy this tactic is to include the upgrade to annual email in a timed onboarding campaign, say after 29 days after the subscription has begun and before the next payment is made. Another option that I’ve had success with it to trigger the email after a user has completed an I LOVE THIS action. Catching them at a happy time with your product will increase the likelihood that they take you up on the offer. At Code School, our I LOVE THIS action would be after completing a course. So we send an email 1 hour after their first course completion. Maybe yours is after they edit their first video or create their first campaign or follow their first friend. Whatever it is, figure it out, and tie it to it. Ryan Hoover of Product Hunt wrote a great post on how startups miss the boat on email receipts. Each month they send out receipts to each one of their subscribers, and very rarely do these companies use them for anything other than ho-hum payment information. Include one FAQ or little-used feature each month. Show pending actions or to-dos. Have a link to upgrade to a yearly subscription. Include a referral link for users to invite their friends. Display how much they’re using your product to justify the price they’ve paid. At Code School, we experimented with our receipts by adding in course recommendations for their next month, as well as a “progress report” of courses completed in the previous month. Emails are a great tool for extending lifetime value and decreasing churn and are a worthy project to experiment with. For more ideas, check out ReallyGoodEmails. It’s a great curation of emails from companies of all types.